Presenting the check are, from left, Alexa Ferrell, third-year veterinary student and OTS member; Dr. Ashley Smith, oncology resident; and Kelly Himeback, third-year veterinary student and OTS member. 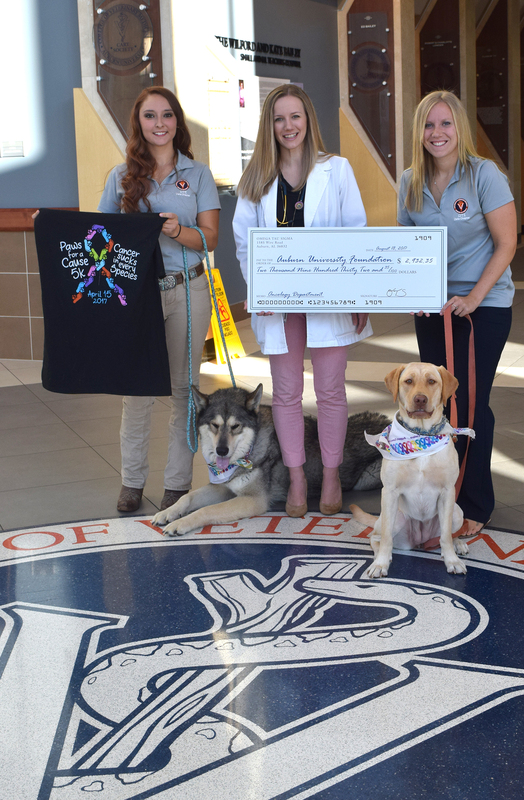 The Auburn University College of Veterinary Medicine’s chapter of the Omega Tau Sigma professional fraternity recently contributed more than $2,932 raised through its benevolent fundraising efforts to a cancer research program at the college. The group, comprised of some 50 Auburn veterinary students, raised the money through its “Paws for a Cause” 5K run/walk held in the spring at the city’s Town Creek Park. “We had a number of participants, some even participated with their dogs,” said the organization’s vice president, Kelly Himeback. The group typically has donated its gift to a national cancer-fighting charity, Himeback said. “This year, we wanted to support a program at Auburn, and we learned about the Osteosarcoma program here at the college,” Himeback said. Osteosarcoma (OSA) is the most common bone cancer in children and dogs, according to Dr. Annette Smith, the Robert & Charlotte Lowder Distinguished Professor in Oncology in the Department of Clinical Sciences and the coordinator of Auburn University’s oncology program, which focuses on a multidisciplinary team approach to each patient and has approximately 3,000 pet visits each year.